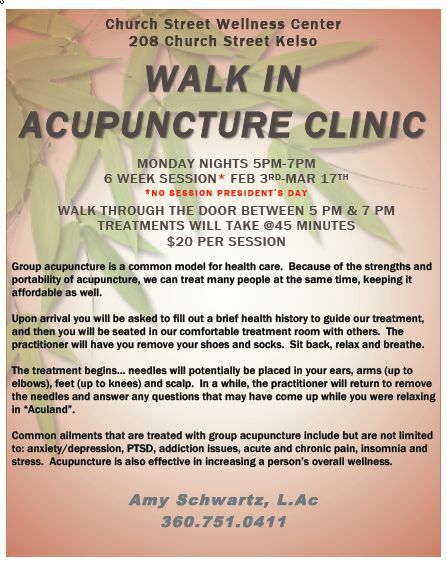 Group acupuncture is a common model for health care. Because of the strengths and portability of acupuncture, we can treat many people at the same time, keeping it affordable as well. Upon arrival you will be asked to fill out a brief health history to guide our treatment, and then you will be seated in our comfortable treatment room with others. The practitioner will have you remove your shoes and socks. Sit back, relax and breathe. The treatment begins… needles will potentially be placed in your ears, arms (up to elbows), feet (up to knees) and scalp. In a while, the practitioner will return to remove the needles and answer any questions that may have come up while you were relaxing in “Aculand”. Common ailments that are treated with group acupuncture include but are not limited to: anxiety/depression, PTSD, addiction issues, acute and chronic pain, insomnia and stress. Acupuncture is also effective in increasing a person’s overall wellness.